Persia invades Greece - Persia actually invaded Greece twice; known collectively as the Persian Wars. The first invasion came in 490 B.C. under King Darius. His intent was to punish Athens for its support of the Ionian Revolt. When he was defeated at Marathon, it was left to his son, Xerxes, to exact revenge. 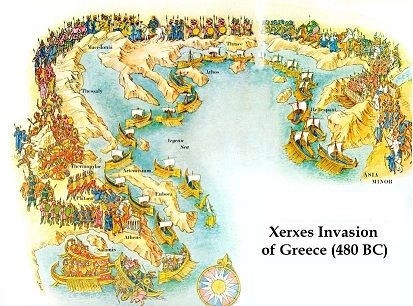 In 480 he invaded with a massive army determined to conquer all of Greece. This is when the famous Battle of Thermopylae was fought. Despite overwhelming numbers, Persia was ultimately defeated thanks to an alliance between the Greek city-states.